Stillingia is a perennial plant; its stem grows 2-4 feet high, contains an acrid milky juice and bears alternate, sessile leaves that have a somewhat leathery texture. The yellow, petalless flowers grow in a terminal spike with the female flowers at the base. The fruit is a 3 lobed capsule. 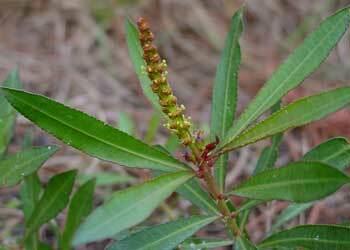 Native of the pine barrens and sandy soils of the southern states of the United States. A decoction of the root once was used to treat obstinate skin problems and help clear up ulcerations and pain after mercurial treatment for syphilis. Treats chronic laryngeal and bronchial inflammations, leucorrhea, chronic coughs, rheumatism, and chronic liver affections. 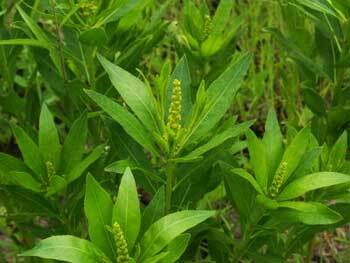 In large doses, stillingia causes vomiting and diarrhea. Use dried, but not more than 2 year old, rootstock. Decoction: boil 1 tsp. dried rootstock in 1 cup water. Take 1 cup per day, a mouthful at a time. Taken internally, the acrid constituents of the fresh plant can cause irritation and symptoms of poisoning.